This past weekend I had some free time and I was able to just have some fun stamping. I thought I would share some of the projects that I worked on. This is a card that I made for a friend of my oldest DS. His friend was celebrating his 13th BDay! 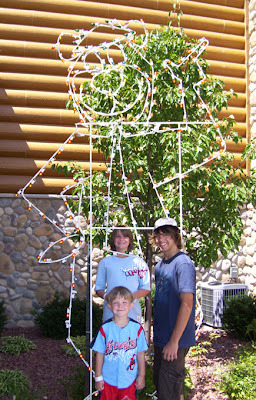 Sometime I think it can be kind of hard to come up with ideas for teenage boys. But I was really happy with how this card turned out, although it doesn't look anything like the vision I had when I started out! LOL! Does that ever happen to any of you? Ink is all SU-Real Red (refill), Basic Black (refill), Black StazOn, Silver Encore! I made this for my youngest DS. 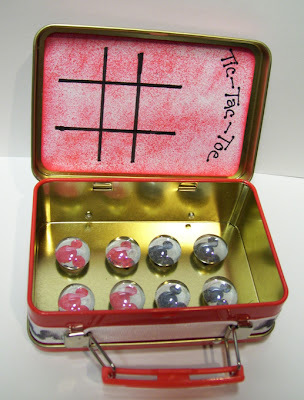 He loves to play Tic-Tac-Toe and this just the right size for when we are on the go! 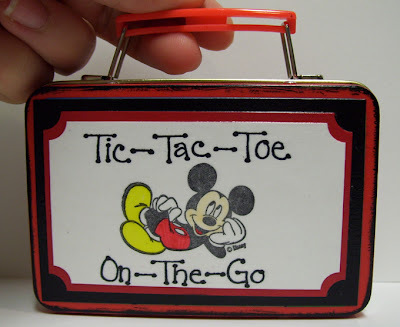 I have had this little tin for some time now but I just wasn't ever sure how I wanted to alter it. I can't remember for sure where I got it-Kmart-maybe? But I do remember it had sour cherry candy in it! Stamp-Mickey Mouse & the little mouse shapes--Good ?--LOL! I have had them for so long that all of the company info is gone from the block!! Sorry!! 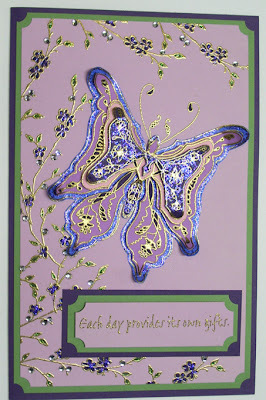 My 1st Butterfly Card with Holly House Originals Medallions~ My 2nd Butterfly Card and also with a close up~ Yes! These do take a while to do!! But WOW I LOVE the end result!! 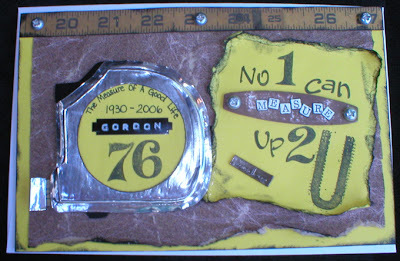 Until this weekend I had never tried any of the medallion type of stamps but now I think this one is a must have!! 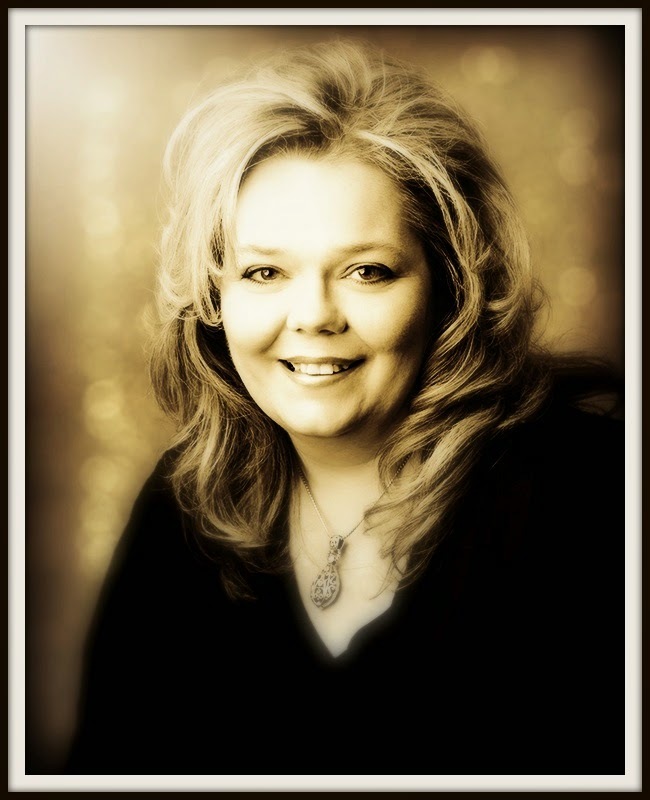 I have to thank my wonderful friend Delores!! She stopped by on Friday and said she had just bought 2 new medallion stamps but it was going to be a little while before she would have some time to play around with them and she thought maybe I would like to try them out!! New Rubber--who would past up a chance for that!! Plus she had copies of the instruction sheets! So far I have these two done and I am working on a 3rd one with a black and orange butterfly which I will post when I'm done. 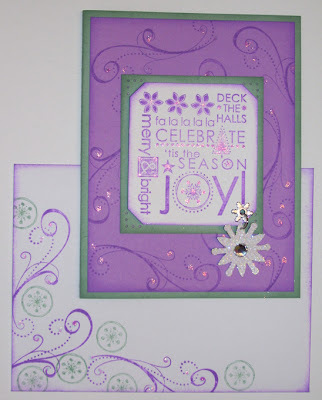 It was so nice and refreshing to have a weekend with some stamping time!! Thank you so much for stopping by and I hope you are all having a Great start to your week!! I've been having fun the past few days--getting to stamp just for the fun of it! *gasp* It seems like from here on out until Christmas my stamping time is consumed with classes and clubs and making Christmas gifts. So when I can grab a little time here and there I go for it!! I haven't had any time to take pictures of new designs and get them on the computer. I was thinking it has been a couple of days since I posted and I wanted to do a little something so I went back and started looking through some pictures and thought I would post some of my favorites. Now I will warn you some of these are my "older"cards -- lol--but they are still favorites. I'm not going to go into all of the detail about each card (stamps, paper) because like I said they are older cards and some of the info I'm just not too sure of anymore. But if you do have a question I will try to answer it. These are mostly just for some inspiration. 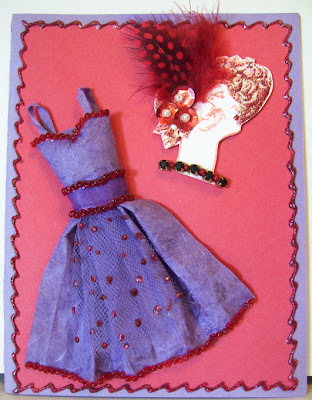 This is a Red Hat card that I made for my Mom and several other Red Hatters. The dress was made from purple mulberry paper. 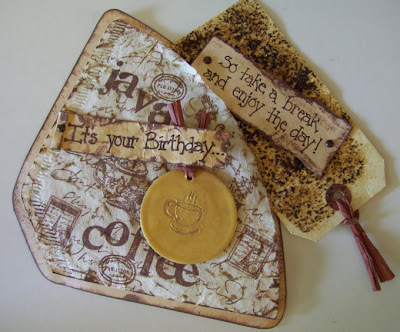 Coffee Filter card with real coffee on the tag and also vanilla bean scent. For this card I posted two pictures so you could see that it really works! I made this for my Grandpa. Now even though I don't have this card anymore (it was a BDay card) it is still one of my all time favorite cards!! I hope you enjoyed taking a look into the past with me at some of my favorite designs and I hope you are all having a wonderful weekend!! For the Christmas Card Club we get together for four months (Aug, Sept, Oct, Nov) and each time they get to make 12 cards! I have three different designs and they make four of each design with matching envies. Once the Club is done in November ea. lady will have 48 Christmas Cards (12 Designs) with matching envies. All set and ready to go for the Christmas holiday!! Thanks so much for stopping by! Just remember it is never to early to be thinking about Christmas and get a jump start on your cards! Do you ever design something and you get so excited about the outcome, because you know it is turning out even better than the vision you had in your head or your sketch? Well for me this was one of those times!! 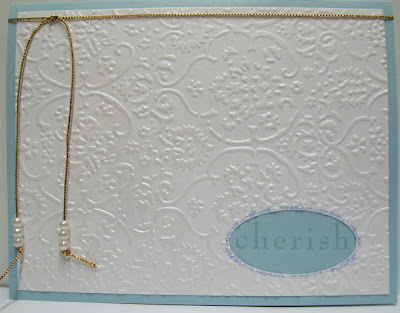 *wink* I am in love with this little gift box!! Plus--BIG BONUS--it is soooo easy to make!! The box itself is made using 2-8-1/2 x 11 sheets of CS. I will try and get the instructions posted for it really soon, but for now I just had to post a few pictures. I started out with Very Vanilla CS and used three colors of ink--Chocolate Chip, Close to Cocoa and River Rock to achieve the look I wanted. For the bottom piece I randomly stippled using Chocolate Chip and River Rock inks. 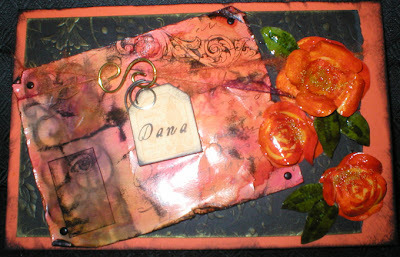 Then I stamped 2 different Flourishes & Swirls (Autumn Leaves-Rhonna Farrer) . One was done with Close to Cocoa and for the other one I used River Rock. After that I used the Spritz Tool from SU along with a Close to Cocoa marker. Once the piece was put together I use the Chocolate Chip ink pad along all of the edges to distress it. For the Top piece I folded the sides in and then ran it through the Wizard using the Cuttlebug Textile embossing folder. 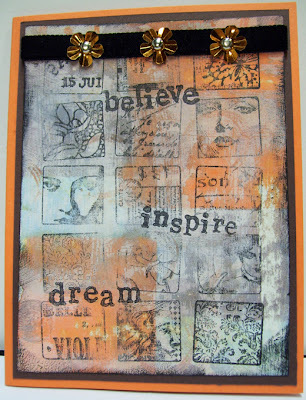 Then I did all of the same steps as above except for the stamping. 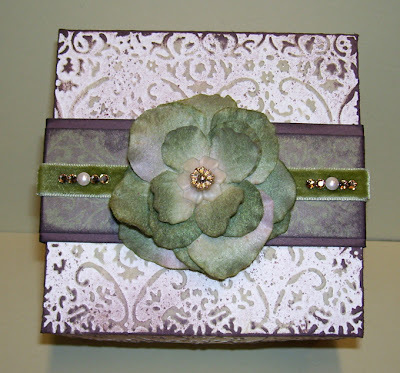 I also made a slider for the box using Chocolate Chip CS and Brocade Background (SU- Designer Series Paper). 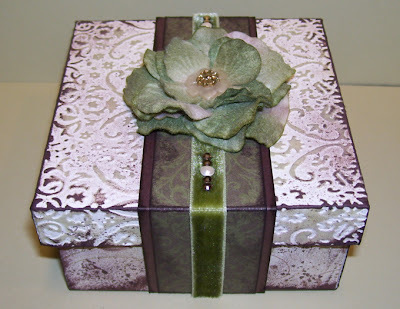 Then I embellished it with a piece of green velvet ribbon, petals from a hydrangea with a button in the center and some swarovski crystals & ivory pearls. Front of box~ I hope you enjoy! Thanks for stopping by & hope you have a great week!! 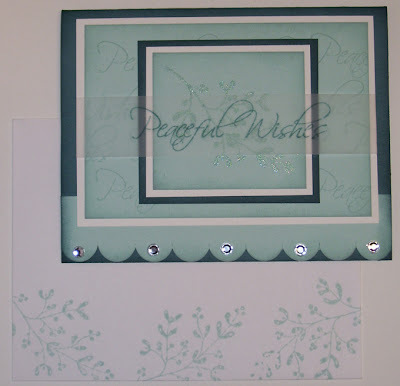 This is the 1st card that we did. The technique for this one was using Distress Inks to create a background but with out wrinkling up the paper. So many of the techniques for distressing want you to scrunch up your paper and for this one it stays flat. I also discovered a while back that if you use the Distress Inks and then iron over your CS some of the inks will change colors which can be very fun to experiment with. Also if you do this you want to have your iron on the highest setting. For the BG piece I used a Cuttlebug embossing folder and ran it through my Wizard and then rubbed over the top with a ink pad. All of the CS is SU-Whisper White, Chocolate Chip, Lovely Lilac. 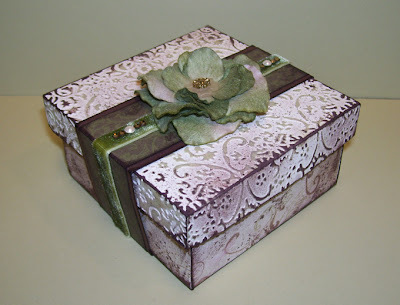 Inks (Distress Ink-Ranger)-Frayed Burlap, Dusty Concord, Weathered Wood. (SU)-Chocolate Chip. Stamps (Autumn Leaves-Rhonna Farrer)-Word Flourishes. Fibers-from my stash. This is the 2nd card. The picture of this card isn't the greatest. :( I was having a hard time getting a picture with out the glare. I think that can be so hard to do with glossy paper! But the card is much prettier IRL!! I love all of the depth in this technique. This is one of the techniques from Technique Junkies. If you don't know what Technique Junkies is you have to check out the site!! It is amazing!! All CS is from SU-Almost Amethyst, Night of Navy, White Glossy. Stamps are SU. Ink (SU)-Blue Frost Spectrum Pad, Versa Mark, Night of Navy, Whisper White. 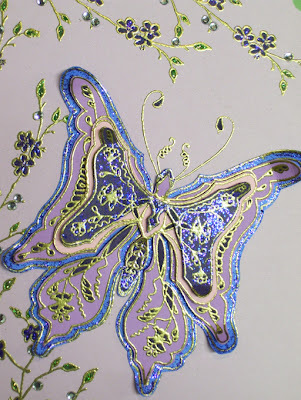 Embossing powder is my own mix of clear and pearlex. Tag punches are SU and ribbons are from my stash. 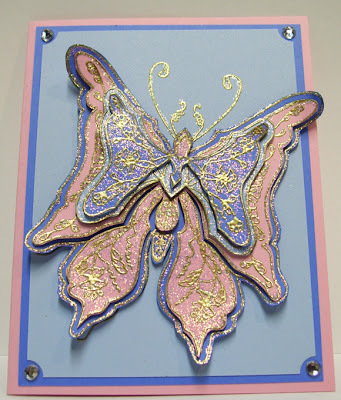 Here is another card with different stamps and color combo using the same technique as the one above. This one was just a sample to show the class the different color and style you could achieve with this technique. Thanks for stopping by and I hope you are having a great week!! 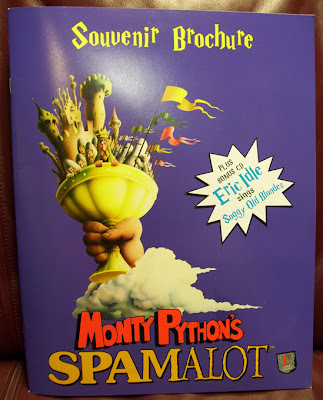 On Sunday after church Eric and I took off for the cities to go and see Monty Python's SPAMALOT!! Eric was fortunate enough to be one of the lucky people to receive FREE tickets to the Broadway Play!! For those of you who might not know, my DH (Eric) is a Supervisor at Hormel. Hormel bought out the show for the day!!! 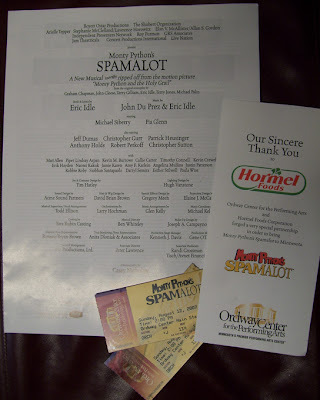 Before the play Hormel had a picnic lunch in Rice Park (right across from the Ordway) and severed--you guessed it SPAM Burgers--they were very yummy! The play was preformed at the Ordway Center for the Performing Arts. It is so beautiful in there! We had great seats!! We were in the 5th row from the stage!! I haven't ever seem Monty Python and the Holy Grail (I know you can't believe that, right!? I must be one of the few!! ), so I wasn't too sure what I was in for. But I have to say we have now rented the DVD and will be watching it very soon!! As for the play OMG I have never laughed so much!! It was sooooooo Hilarious!!! The acting, singing, costumes it was all so wonderful!! Thanks so much to Hormel for a wonderful day!! Yes I know I'm running just a tad bit late with this. *wink* I wanted to post this before we left for vacation but just didn't have enough time. 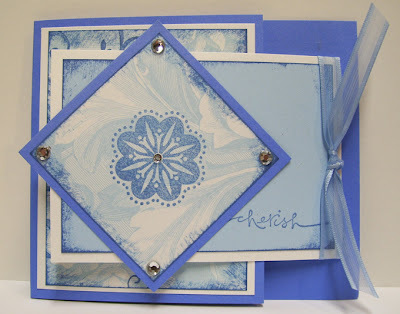 These are the cards that we did in the July class. 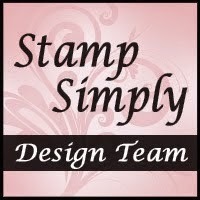 For those of you that might not know it I teach stamping classes in my home a couple of times a month. I have a really great group of ladies and they make doing the classes so much fun!! This is the first card that we made. The CS is SU and the printed paper is from my stash (sorry not sure of the company, nothing is printed on the back). The stamps are from SU, Baroque Motifs and Warm Words. The sentiment on the inside is also SU but it's a retired one. I love this card! At first I thought OMGosh it is going to take forever to make this card but once you get your pieces cut it all goes together very quickly. Inside of the first flap Inside of the card. This is the second card we made. This is one of my favorite techniques for doing a background. It's kind of messy but so worth it!! 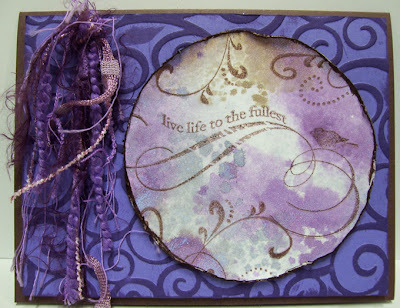 I just love the distressed look and I love to play around with different color combos too. All of the CS is SU. 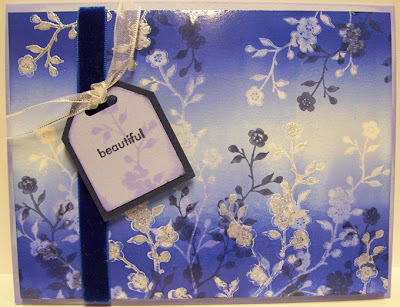 The large background stamp is from Hampton Art Stamps. The word stamps are from Clear Stamps. 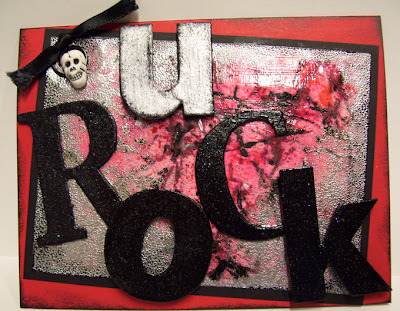 This is the last card that we made and it is sooooooo easy, but they all loved it!! It doesn't show up very well in the picture but the embossed paper has pearlex on it. It gives it such a pretty shimmer. 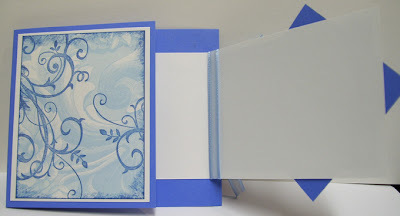 The embossed paper was done using a Cuttlebug embossing folder and running it through the Wizard. The CS is all SU. The stamp is SU , Baroque Motifs. 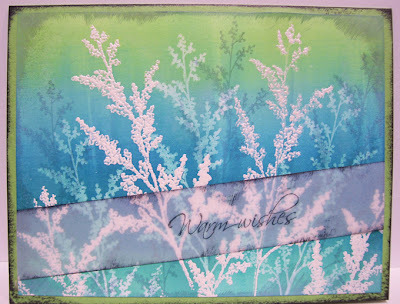 Here is another card, this is one that we made at my SU Open House for the New Catty. 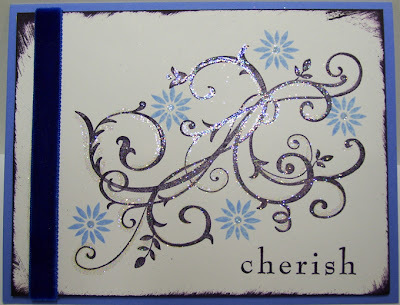 Another Baroque Motifs card *wink*--can you tell I love this set!!! It is so easy to work with! This is what I would call a stamper friendly stamp set. It's a set that would be wonderful no matter what level you are at with stamping, even for someone who is just beginning. 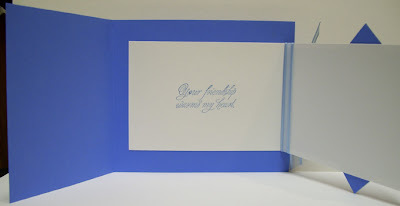 One of the ladies that came to the open house brought a friend with her and she had done a little bit of stamping but it had been several years ago and she just couldn't believe how easy it was to make this card!! Thanks for stopping by! Hope you enjoy the cards and have a great start to a new week!! 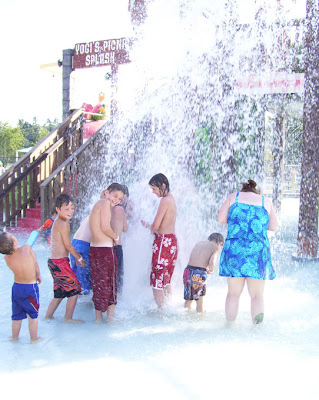 This is one of the outdoor water parks. 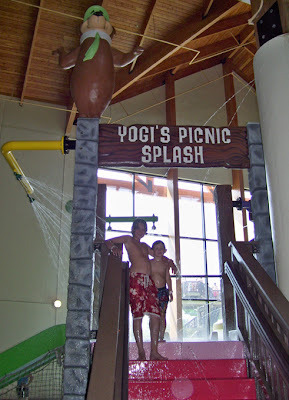 They have yogi's picnic splash, the beach, pool for basketball, two reg pools, kids pool, hot tubs, wave pool and the lazy river. 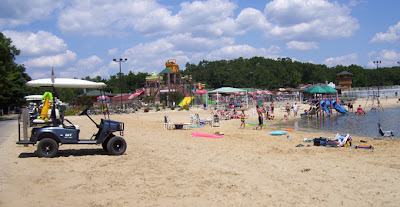 This is a view of the lake where you can do the paddle boats. 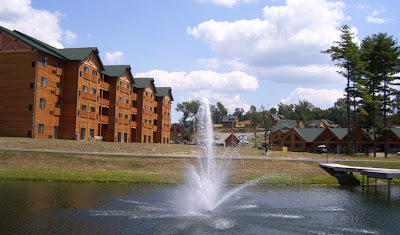 The Lodge is to the left and the villas are in the background. 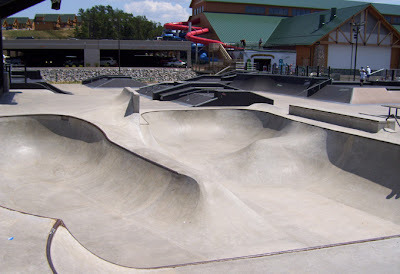 The Skate Park. 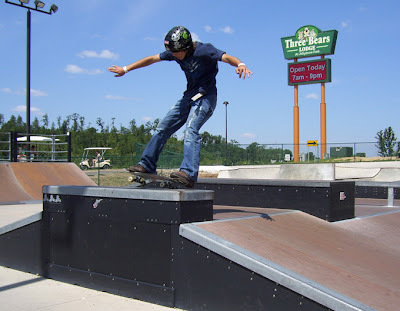 It is the largest outdoor SK8 Park in the state of WI. 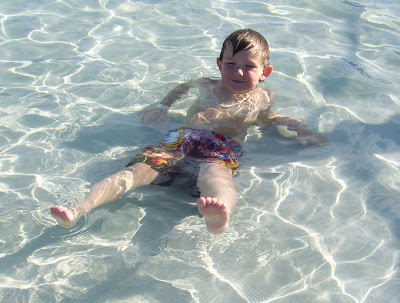 Evan kick'n back in the pool. This is at the Yogi's Picnic Splash. There is a picnic basket that dumps water every 5 minutes and the kids run to get under it when they hear the horn. Dusty keeping the camp fire going. 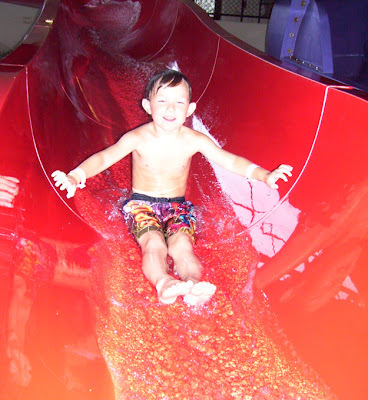 Evan coming down the water slide. I know this picture is really dark. We went to this place that was right across the road called Craze and they had a bunch of fun stuff to do there. 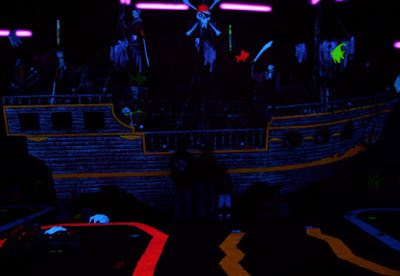 One of the things was black light mini golf. The theme was underwater adventure. It was really cool inside there!! This is a picture of the big ship in there, the boys are standing in front of it. Eric making breakfast for us all. He also made bacon and eggs. Yummy! 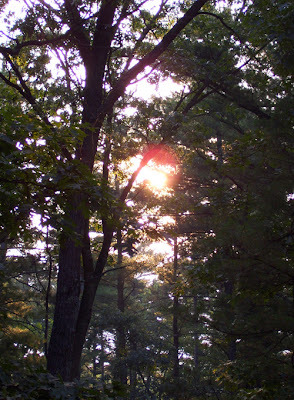 This was the beautiful view we had every morning from the deck of our cabin. Thanks for stopping by!! I hope you enjoy all of the pictures!! Vacation was Great!! 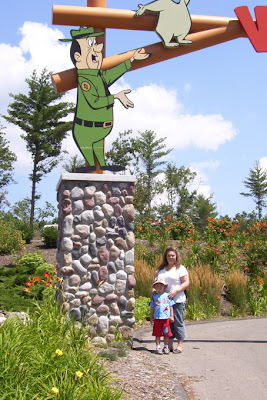 The boys had a blast, swimming, skate boarding, mini golf, camp fires and the list goes on... We stayed at Jelly Stone for six days and it was go, go, go the whole time!! 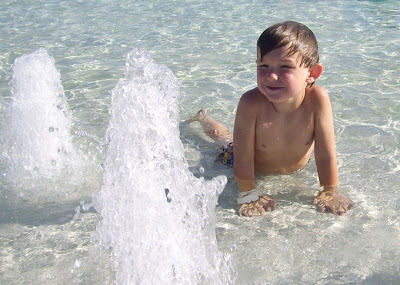 The weather was great and we spent a lot of time in the water. I got a nasty sunburn the very 1st day we were there--yuck-o! I had a TON of sunscreen on but I am so light complected it doesn't take much for me to burn. 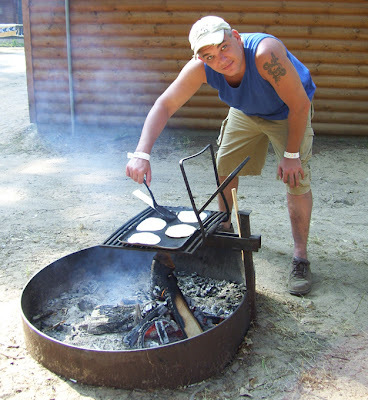 We went out to eat a few times while we were there but most of our cooking was done by the camp fire. Eric was in charge of breakfast, we both did lunch and I was in charge of supper and at night before we went to bed we always had a small fire so the kids could make dogs and s'mores. 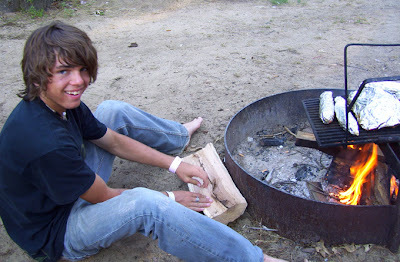 Sure do miss the smell of the camp fire!! But I have to say it was nice to come home again and sleep in our own bed! Here are a few pictures from Jelly Stone. 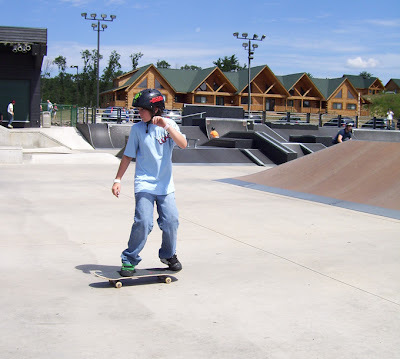 Evan at the Sk8 Park. This picture just cracks me up, he posed for this all by himself-LOL!! 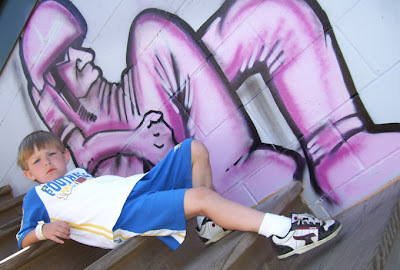 He was trying to copy the graffiti art! Dusty at the Sk8 Park--landing one of his tricks. Dusty just found out a couple of days before we went to Jelly Stone that the local bike/sk8 shop is going to sponsor him for sk8bording!! He is THRILLED!!! It is taking me awhile to get back into the swing of things after being gone!! It seems like forever since my last post!! While we were gone my BF (Gina) and her kids stayed at our house and took care of our animals. They live out of state and were also up for a wedding. They stayed until the Friday after we got back so we were able to spend a few days just hanging out together and our kids had a blast playing together too! Then it was time for our county fair!! We live right down the street from the fairground, so that is another busy, busy week too!! The last day of the fair was Sunday and then it was time to start prepping for another class. 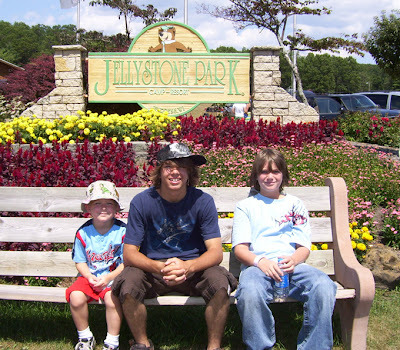 Also this week was the last week that my stepson was with us. He always spends the summers with us and this morning him and Eric left to meet up with his mom in IL, they meet 1/2 way. So time seems to have just gotten away from me!! 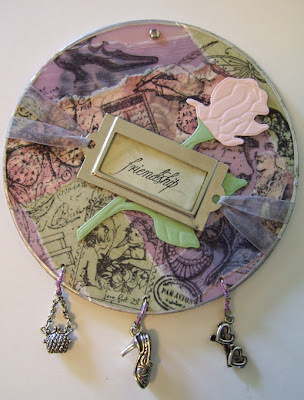 I will post more pictures from our vacation tomorrow and also post pictures from the last stamping class. Hope you are having a great weekend! !